Thank you Iain, ‘like’, ‘share’ and endorsements are always appreciated, my sincere thanks go to those generous souls who post them. J.L. wrote; “Knowing the legendary Sir Robin Knox-Johnston commissioned paintings from you is more than a recommendation as far as I am concerned”. This picture is available on canvas as a signed print prices from £147.00. Try our free fun XE Currency Converter. Our printer at Adaptgraphics, Plymouth, has excelled himself, enjoy. Although the company has a long fascinating history, was loved and respected, BI was little known in Britain. In turn he has worked in shipping, still does, all his life and has a very personal connection with Bamora and Canberra about which he has written in ‘further reading’, discover via the link below. By 1922 The BI fleet was the largest single merchant fleet in the world with 158 ships of nearly a million gross tons afloat and in regular service. 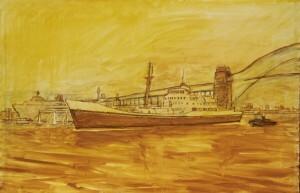 Other British India Steam Navigation Company ships painted by Gordon Frickers include Uganda, Dumra, Kampla and Rajula. “If Mr Frickers was good enough for Sir Robin, then he would be more than good enough for the likes of me” ~ J.L. 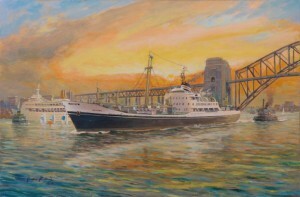 Bamora at Sydney, with Canberra in the background was the client request. Following a little initial research and a chat over the phone together we decided we would like to go further than the usual ‘ship portrait’ aiming for a ‘full on’ harbour scene and colourful sunset that would do justice to two great shipping companies. With some clients once the command is given the artist is expected to ‘get on with it’, Gordon likes that. Some clients are fascinated by the process and wish to follow the creativity more closely. In this case a close, sensible and warm client artist relationship gradually developed which has undoubtedly contributed to the high quality of this painting. Gordon Frickers said “I like that too”. We settled for “Bamora” in the foreground with much larger Canberra at circular quay in the background, thus Bamora is outward bound having just passed under the Sydney Harbour Bridge. On departure from the berth her tug Woona according to ex B I seamen would have been released just before or just about at the bridge. Consequently Bamora having released lines and while “waving” good-bye to Woona has telegraphed ‘slow ahead’ so is picking up speed, making for the open ocean. Our choice of layout immediately presented some stiff drawing challenges notably the double diagonal perspective and scaling off correctly the distances. creation of this project”. J. L.
Suitable reference material took a while to find, Gordon Frickers was unable to remake contact with the P & O archives, of the few available photographs most were of quite poor quality. Following the exchange of and client’s approval of sketches and a drawing their exchanges were expanded to include photographs and commentary a discussion charting the steady progress of the new painting. Drawings like this one (sold) illustrated here are available for £250.00. They can be purchased securely from the web site payment page using Paypal or by bank to bank draft, in installments if that helps you. How much in my currency? A number of important details remained obscure. Fortunately we are operating within living memory thus several ex B I people volunteered helpful information which makes this painting some thing of a bench mark and legacy. 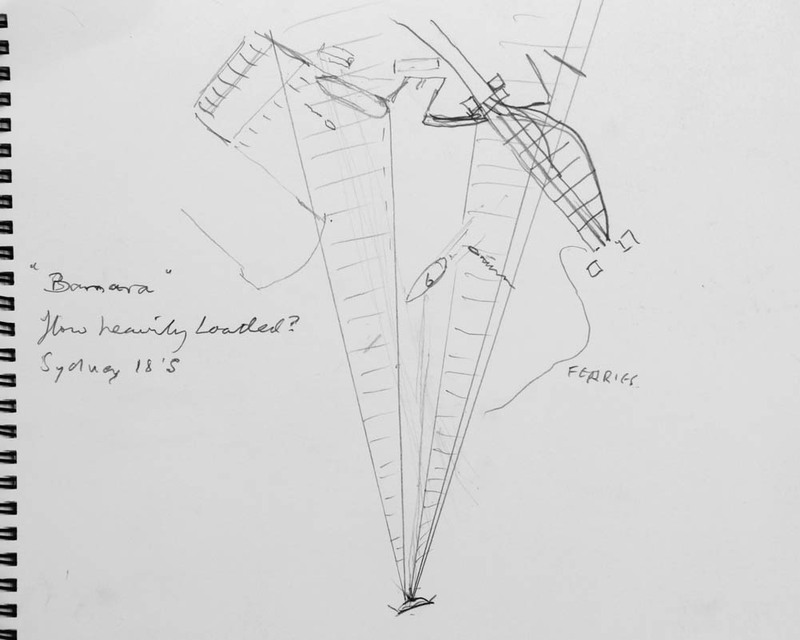 “Your sketch of the Bamora brings back many happy memories of my time on Bombala. They were splendid small ships and decades ahead of their time. The lovely rounded bridge front was very ascetic and gave the ships a real sense of style. 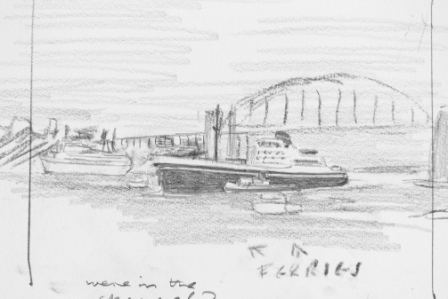 I still have your Calmac drawings and am hoping to one day to have them hanging in the study”.J. S. (Captain) ex BI. The selection of the artist for this adventure was a much easier task that trying to find the right starting point for this article. Gordon Frickers first came to light after clicking a link from a website BIship.com. An informative site for all those with an interest in British India Steam Navigation Company, more affectionately known and remembered as B I. The link introduced five artists. Recalling a reference from my late Father “Barney” I was quickly drawn to the name Sir Robin Knox Johnston. If Mr Frickers was good enough for Sir Robin, then he would be more than good enough for the likes of me. Artist chosen, lead to the next question would he accept the commission? Why commission a painting? I was looking for something tangible that would become a fitting tribute to Barney and something I could share with my family. Reflecting on the last time I saw my Father well was when he and my Mother visited Kings in early October 2012, whilst I recovered from major surgery. I had no idea that about 6 weeks later we would lose him. A memory that remains vivid and one I sought to change for the brighter. A painting was the way forward adding to the luxury prints could be ordered for distribution to other family members with a Remarque, in this instance a small portrait of my Father. Initially I had three specific thoughts for the subject, all B I Ship related. Why B I? Barney started his shipping career as a Deck Cadet, with many a tale to tell with BI. When ashore studying for his tickets he was not salaried (times have changed), hence it followed there would have been a high incentive to pass every exam first time. By the early 1960’s he had gained his Extra Masters Ticket. He was very proud to have served with BI and would strongly defend the good name of the company. 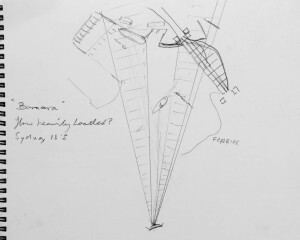 Discussing the various ideas I had for a commission with Gordon Frickers we were very quickly drawn to the concept “Bamora” and “Canberra” at Sydney in the early 60’s. This held a much greater family interest than the ship Barney took command in the early 70’s “Chupra”. When launched “Bamora” was one of a series of new generation cargo ships, the envy of many who did not have the privilege to sail on her, air conditioned! Fluorescent lights in the holds! Push button “opening” “closing” hatch covers against the older system of batons and boards! Known to BI as the “B” class these ships were launched in the late 50’s early 60’s. “Bamora” launched in 1961. 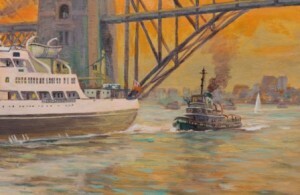 “Bamora” was to ply the Australian coast so making many a visit to Sydney. Barney was the ships Chief Officer, who to this day is still fondly held in high esteem by the junior officers he nurtured and guided. As a senior officer he was entitled to the privilege of having his family on board. 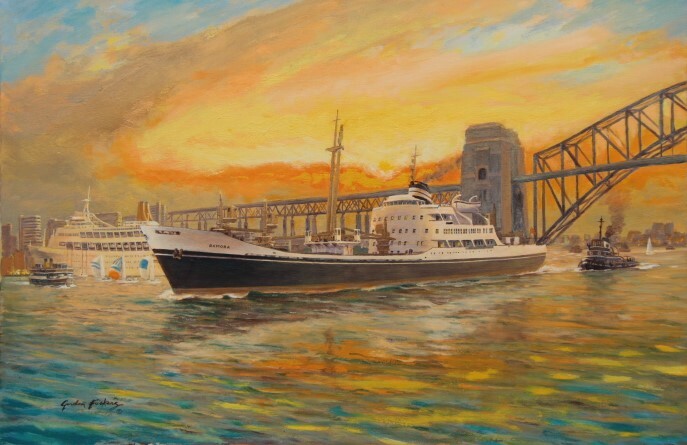 I and my younger brother Richard being lucky enough not to have to attained school age, found ourselves setting sail from Southampton on SS ”Iberia” bound for Circular Quay, Sydney to meet up with “Bamora”. I still have to this day my certificate for crossing the Equator. We spent many a happy time on board “Bamora”, and as young lads we were fascinated by some of the cargoes carried, eg Sheep on deck in pens! We were not so happy sailing through the Australian Blight. A notorious area for heavy seas, on one particular voyage steaming through “Bamora” pitched and rolled to such an extent that a much favoured toy (a remote controlled bus) that neither I or my brother were allowed to play with, slipped from its less secured stow coming to a crashing end “hitting” the deck. I do not recall the cargo officer ie Ch Officer being held account for such a remiss. Family friendships made on board have held good all these years reflected by the support I have had in the making of this painting from the Officers who sailed with us. Communicating with the 3rd Officer and Deck Cadets as they were all those years ago has been extremely rewarding, entertaining and informative. To them all I “Dip the Ensign” as a sign of respect to another ship. I choose the word ship rather than vessel having had it drummed in me from a very young age by my Father. The nautical definition of ship I am presently unable to recall, but suffice to note it is not as defined in the Concise Oxford. [Vessels are hollow, ships have character, ships carry boats, boats do not carry ships. More seriously ‘ship’ origin early medieval? has generally meant a prestige sea going vessel. During the 18 th and 19 th centuries more specifically ‘ship’ meant a three masted sailing ‘ship’ square rigged on all three masts. At that time anything else was not a ship it was something else ~ Gordon Frickers]. 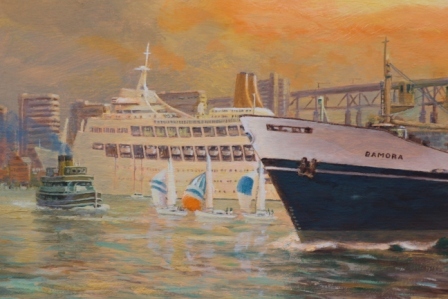 “Canberra” – Cine footage taken by Barney aboard “Bamora” captured the P & O liner “Canberra” on her maiden voyage to Sydney. Canberra was a sensational ship when new incorporating many novel features now regarded as standard, engines aft being but one Canberra even attracted the accolade of having an Airfix (plasctic0 model produced of her. For those unfamiliar with Sydney, Circular Quay (passenger terminal) it is just before Sydney Harbour Bridge and the commercial berths “Darling” and “Pyrmont” located on the port side just past the bridge. “Bamora” would have passed relatively close no doubt saluting “Canberra” as she entered. Little did we know at the time and much later in the life of “Canberra” my sister Christine was to serve as a Purser. She loved “Canberra” so much (an iconic liner, more recently remembered by many for her role in the Falklands conflict) that when she was ordered to another ship she resigned from P&O. Christine with my other sister Alison also enjoyed the delights of cruising on the ship as passengers with my parents. It was not all work then Christine! When “Canberra” was launched she very much followed in the P&O tradition of luxury travel, rooted in days gone bye when time seemed incidental. Migration to East – South Africa, Australia, New Zealand, was very much in the fore a trade “Canberra” and others served well. Royal Mail contracts were an attractive addition to the earnings of these fine Liners. I cannot think of a better way to travel in comfort and at your leisure. Today our life’s are at a much faster pace, does it have to be? B I and P & O – I am sure having read this far you can see how two ships from differing companies are closely linked to my family. What many of you may not be aware of is the commercial closeness of BI and P&O. In 1914 P&O amalgamated with B I, although some years later P&O acquired the controlling interest of B I, B I for many years traded in their own right. By 1922 The BI fleet was the largest single merchant fleet in the world 158 ships of nearly a million gross tons afloat and in regular service. I having grown up with BI recalling the greatness of an often forgotten British Company, feel an affection to BI that is hard to describe, whether it was the ships, or a sense of family, or just grateful that I was able to spend many happy years dockside, walking up the gangway, hearing the generators purr, whilst cranes overhead positioned the goods, or a combination of factors. One thing is certain without my late Father “Barney” I would not be writing this tale now. The Painting – This story has taken more than a thousand words, but the painting says so much more. I like to think at the time of commissioning I was embarking on a Voyage of Discovery, from which a warm working relationship developed with Gordon Frickers. There is no doubt in my mind that his Marine knowledge has made the painting what you see today. During our various exchanges we have taken a “Maritime Adventure” to a new level. I have on occasions joked as to who was the Master and who the Merchant? Together we have navigated our way to a conclusion were I am feeling emotive and delighted at the tribute left to both my Father and the memory of a much loved and forgotten British Shipping Company BI. From a young age my career path was laid. My Grandfather had served Southampton for many years as a Port Agent, who held such a reputation that it was not just his company that was appointed but also himself by name to attend to a Ships need. Whether a VIP from a Transatlantic Liner, to the commercial needs of a Merchant Ship. Growing up with BI later P&O listening to family yarns, I soon found shipping becoming deeply embedded within my veins. There was only ever going to be one career for me on leaving school. British India Steam Navigation Company whilst relatively unknown in Britain provided sound officer and sea man training. The company emerged during the 1840’s when a young hopeful, William Mackinnon arrived in India and set up with Robert Mackenzie as general traders. Their timing and honest industry was good, they prospered. By March 1864 the name British India Steam Navigation Company Ltd was afloat. A post with B I became much sought by both European sea cadets and the mostly Indian crews. Proof being many ex B I people speak very fondly of the company and officers subsequent careers have greatly enriched Britain and the wider world; Robin Knox-Johnston was one of those officer cadets. Another, at the period shown by this painting was Barney Leeson serving as a Chief Officer. He was to become aMaster and eventually a Director of The P and O General Cargo Division. Today we can only envy the officers of that time, the ships sailed, the ports visited, and the crews keen, proud in their smart uniform. The method of loading and unloading the cargoes of the day meant you were guaranteed some time in port. A lot more individual responsibility fell on the officers on board bearing in mind communications were not as advanced as they are today; boys quickly became men. A captain might decided to sail without a pilot and navigate through the Great Barrier Reef rather than suffer lost time in port. Real ships, real men, under real management, under real training, the industry is sadly very much a different place these days! A world closer to a novel by Joseph Conrad or more recently as evoked by Michael Lloyd than to today. A captain was very much ‘master before God’. In almost every office today we notice professional pride goes out the window for the sake profit at all costs, even new paintings and new ship models of the sort that used to adorn reception spaces and public rooms are becoming rarities; invariably all is dictated by share holders and enforced by the MD. B I eventually merged (don’t say ‘taken over!’) with P & O who had built and owned Canberra. Whilst B I finally disappeared in 1971 during a P & O reshuffle, happily P & O are still with us today. Most BI ships were named after villages and towns that had connections with BI, hence Bamora. Almost all the names finished with the letter ‘a’. This was the second BI ship to carry the Bamora name. The first Bamora (1914 to 1950), 3,285 tons gross, was built by Barclay, Curle & Co Ltd of Glasgow. The old class were all given names beginning with BA so also know as ‘B’ Class. Attractive workman like ships they provided a Bombay Basra service of a quality previously unparalleled. The Bamora & the ‘B’ Class. 395.0 ( 426.05 LOA), 4th ship of the class launched in September 1960 by Mrs R H A Bond, entered service 1961, sold 17 th April 1971. Gross Tonnage 6745 Nett Tonnage 3671, DWT 7323, Draft 25.6 feet. All accommodation was air conditioned included an owners suite for two passengers. The last years of the 1950’s saw architects new to BI, Burness Corlett & Partners chosen to design a class of ship entirely different from previous BI typical general cargo ships of the period. Going further, for the build B I chose Harland & Wolff, Govan Yard who had never previously built a BISNCo. 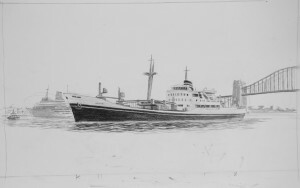 Among the firsts for this class were the Sharply raked stem, the unusual ellipse of the sheer, moulded centrecastle, sheer mast & signal mast with radar scanner fitted out of the funnel, alternating current was used for all onboard functions including the cargo hatches served by derricks including one of 30 tons and 5 electric cranes. for the first time in a BI ship, all crew berthed in cabins in the centrecastle, there were additional cabins in the aft deck house for 10 extra crew and tally clerks. Bamora, one of five sisters, a ‘B’ class represented a considerable leap forward in BI ship design. Bamora was built for the British India Steam Navigation Company by Harland & Wolff, Govan Yard who had never previously built a BI ship. The B Class were to become the ultimate development of a type of ship known as a tramp steamer, a type who would go anywhere she could float to load or with a cargo be to be sold, a type who could trace her ancestry back to the earliest ocean going steamers and through them to the old windjammers, square riggers, galleons, carracks and so into antiquity. For further information Gordon Frickers highly recommends “The British India Steam Navigation Company Ltd”, authors W.A. Laxon & F.W. Perry, published World Ship Society 1994, ISBN: 0 905617 65 7 and the book’s parents, The World Ship Society. “Canberra“LOA 818.6, DWT 9910, Max Load Draft 32′ 0”, Gross Tonnage 45270, Nett Tonnage 23968, The Gross and Nett Tonnages are the figures for the period 1961 / 62. Top speed on trails 29.27 knots. Canberra was the largest P & O ship up to that time, built Harland & Wolff, Belfast, same builders as Titanic. Maiden voyage to Australia June 1962. 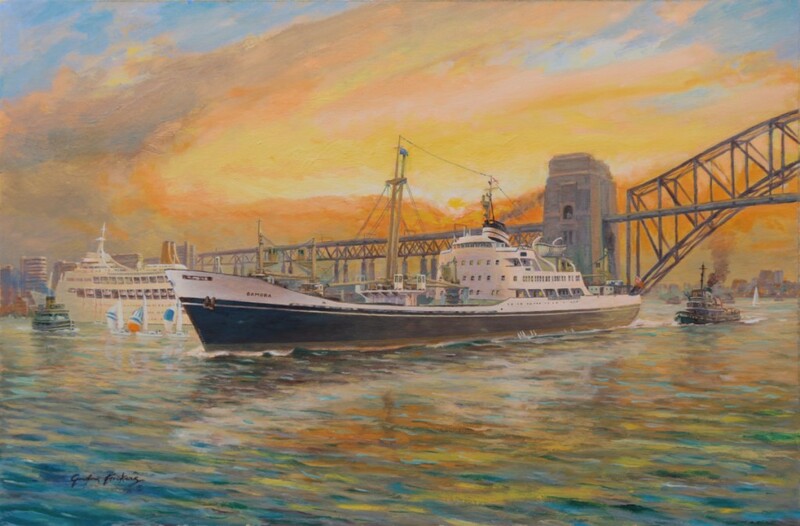 During the 1970’s Canberra was converted to a one class cruise ship so became the first P & O ship to enter New York habour for over 100 years. The Falklands war: Canberra served as a troop ship nick named ‘the great white whale’. 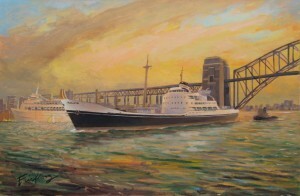 Post war P & O found Canberra was famous and fully booked for cruising.